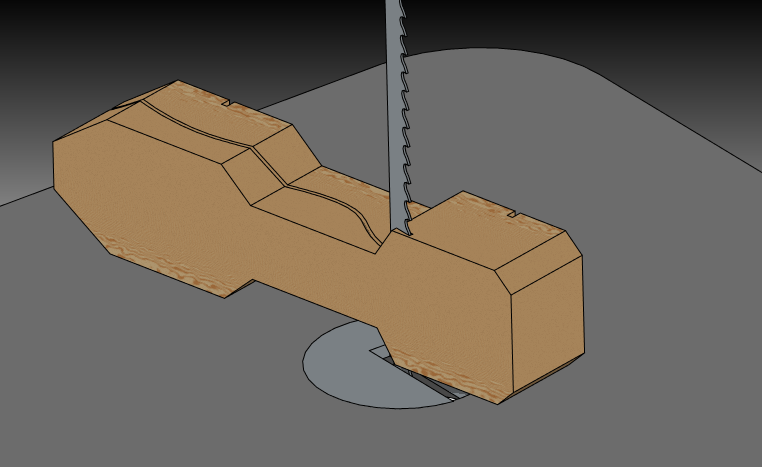 A bandsaw can be used to cut top and side profile. I like to tape the block back together after cutting the top profile. First of all, I would like to say that bandsaws are very efficient finger removing machines. NEVER ALLOW A CHILD TO OPERATE A BANDSAW! Before you begin, know that you will need access to a bandsaw to cut the car out, and a drill press to cut holes for the lead. You will also need either a router or a milling cutter to cut out the underside of the car body. Sanding of the wood to its final shape and finish is best done by hand, but a belt sander can help shape the overall contours quickly. 1) First of all, buy two kits for every car you build. Test the wheels on a polished nail to see if they vibrate or wobble. Use the bad wheels for practice when you turn them in a drill press to remove the mold marks and flash. You may need a wheel mandrel or “tuning kit” . 2) Polish the axles in a drill press or a Dremel tool (you need a smaller collet to chuck the axles in a Dremel tool). Use a file to do the rough cutting and progressively finer sandpaper. The higher the sandpaper number, the finer the grit. I start with about 600 grit and then use pumice on a piece of chamois. Then I polish the axle with jewelers’ rouge. You can buy pre-polished axles , but part of the fun is getting the axles just right. By the way, this is the only thing Dremel tools are good for in terms of making pinewood derby cars. They are lousy at shaping the contours. 3) Put the weight in the back of the car. This increases the potential energy that your car has. I put the rear wheels as close to the back of the car as I legally can, so the front does not “wheelie” off the track. 4) Do not point the front end of the car, it will be hard to line it up on the starting gate, and hard for the sensor at the finish line to see it. Machine screws allow precise weight adjustment. Simply add flat washers or star washers to increase the weight. I put the car on the scale and add washers until I go over 5.0, then remove the last one. 5) Get as close to 5.0 ounces as you can. I use epoxy to affix a machine screw in a hollowed-out cavity underneath the car. This allows me to add or subtract weight in very fine increments on race day. The one tool you really need access to is a kitchen scale. You should be able to get a reasonably accurate one for about $15.00. 6) Use graphite all over the wheels, inside and out. I like to dump a whole tube of graphite in a zip-lock bag and massage it into the wheels for several days before I put the wheels on. 7) Test the car on a flat-topped table to make sure it rolls straight. 8) Use super glue to glue the nails into the slots. Don’t glue the wheel! 9) Have Fun! Many kids will race, only a few will win. Give it your best shot, be honest and have a great time! We would all love to see your car, so email us a photo (pinewood@boysdad.com) and we will post it on the site! Thanks for the cool design. I’m curious as to how deep you drill the two 3/8 holes in the rear. To avoid molten lead, you can purchase 3/8 inch lead wire from any of the online PWD sites. I have used a similar design and drill the hole all the way through. Clip the lead wire and use wood putty to close off the hole. How are the Machine Screws attached ??? Super Glue??? I use 5 minute two-part epoxy to hold the machine screws on. Set the car up on end (so gravity holds the screws in place) while it sets. Do you fill the cavity underneath the car that the screws are in? Do you have any pics of it when completed with nuts and washers? My son just won first place in his pack. Now we have to go race against other packs on April 9, 2011. I want to thank you so much for all tips you have on your site. Everything you have on your site is excellent. We used the Luthor car, it did great. Thanks again for everything. But the best part about the whole race was, how all the kids enjoyed themselves, and the great sportsmanship. Wish us luck on the 9th. I have followed the plans for the flying wedge. With the weights in the drilled holes and the machine screws, washers, and nuts, I can only get the weight up to 4.3 ounces. Any other suggestions would be appreciated. Thanks. Did you use lead or “storebought” weights? If you are using lead, you should be much closer to five ounces than that. 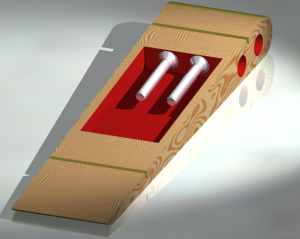 The best way to get more weight fast is to use tungsten welding electrodes (.125″). You can snap them off in a vise to the right length very easily and slide them into a drilled hole of the same diameter. The only problem with these is that they are expensive, and you usually need to buy more than what you need. The next best thing to try would be the “Pinecar” stick-on weights (but their density is low, so they are not a very efficient use of space). Hey there and what a great site. My son and I are building the wedge car and so far so good with everything we are doing. The only snag we have come across so far is on the bottom hollowing out of the car. We are a little confused with the design and how deep the cavity should be where the screws will be placed. I assume the side view of the plans go on the bottom of the block not on the side. and do they go on both sides. Don’t know if I am making any sense. Just dont want to make a bad mistake….thanks in advance..any help would be greatly appreciated…. Have you tried Pledge cleaner on the axles instead of graphite? I was told that it works as good or better. Think of the wood counters after they are cleaned.